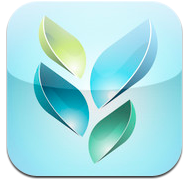 Using Socrative app for iPad – AfL the fun way! I have recently started to experiment with the Socrative app that is available online and via apps for iPad, iPhone and also Android mobile devices. 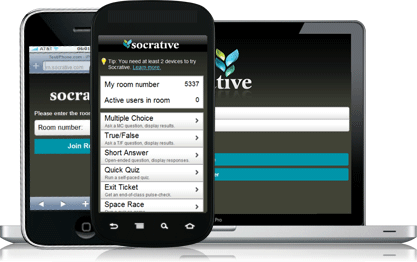 Any device that access the internet can utilise Socrative in the classroom. 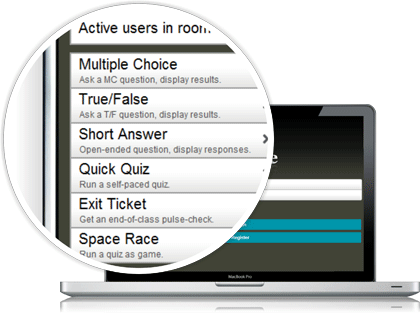 Socrative brings smart clickers, student response and ease of use to a whole new level. Students can be engaged all lesson with educational exercises and games. You can gather feedback instantly from all students anonymously. Socractive has a wide variety of activities to use when assessing students learning. Students can access the specific ‘room’ of the teacher to answer the question that have been verbal asked or from a pre setup quiz. All feedback can be seen instantly by the teacher and can also be shared at the end of a quiz via a report. These reports offer a breakdown of each students response to the question. It even marks the quiz and responses for you! I recently used a ‘Space Race’ quiz that I had made as a starter activity to assess prior knowledge of a topic and the students loved it. The loved it so much that the students developed there own ‘Space Race’ quiz during the lesson to use during the plenary exercise. The students can watch their rocket fly across the screen and compete with all members of the class to complete the exercise. Excellent motivation for learning and AfL combined. The work that @asober, @tesscience and I have carried to make this app a must have in any classroom can be seen here where we produced and shared a collection of Socrative quizzes ready for the exam season this year.